Barnes & Noble’s PubIt self-publishing platform just went live over the weekend (I don’t know if October 1 still counts as “summer” — maybe here in South Florida it does?) 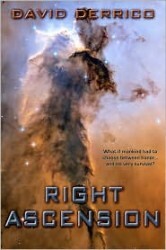 and my e-books are now live on B&N.com. It’s a very exciting development, as B&N now matches Amazon and allows authors to bypass gatekeepers, publishers, and even intermediaries like Smashwords: authors can upload their own e-book files for sale on B&N.com. Since Amazon is the clear #1 e-book seller and B&N is solidly in the #2 position, this allows indie authors to reach the vast majority of the market directly. 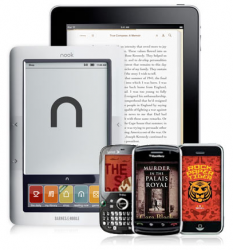 How It Works: Authors or copyright holders can upload e-books in various formats, although it’s best to upload in the Nook’s native ePub format, so B&N doesn’t need to do the conversion for you. I believe you can also upload in HTML or text, but your results may vary. You upload your file and a cover image (in JPG format), enter your info (title, author name, book categories, etc. ), and enter your book’s description, editorial reviews, and an “about the author” blurb. Once you submit, your title will go live on B&N.com (it took about 12 hours for my title to show up, but 2 days for the cover art to appear). More control over the final format: I can improve the quality of the reader’s experience since I can upload the finished ePub file and know it looks perfect, with a working table of contents, etc. More control over the categories the books appear in, their descriptions, etc. Quicker speed of updating: Smashwords would take anywhere from a couple weeks to several months to update prices or an e-book file on B&N; now, if I need to fix a typo or change a price, I can upload it and the new version should be live in a day or two. B&N’s “LendMe” feature is enabled, so users can loan the book to friends (once per book, for 14 days). No DRM! I was able to opt-out of DRM (copy protection), which can cause problems for consumers; now users can backup their e-book files on their computer or convert them to a new format if they get a Kindle or whatever. * Note that Amazon pays 70%; however, Amazon takes off a small fee based on the e-book’s file size and only pays 35% on foreign sales, so the true average rate is closer to 60%. I’m very excited by this development: it provides a better experience to readers (a better-formatted e-book file, quicker updates and fixes, LendMe, and no DRM), and is better for me as well (instant sales reporting, more control and quicker updates, and higher royalties). I love win-win scenarios like that. Also in the plus column: my ratings and the great reviews that I was fortunate enough to receive on B&N transferred over to the new versions as well. A HUGE thank you to all my readers who have rated or reviewed the books on either B&N or Amazon: it really does help me out more than you’d probably expect, and I do appreciate it greatly. WOW! Before I even finished typing this post, I just checked my B&N sales and see a couple of sales showing up already! To my mystery shopper: THANK YOU, and I hope you enjoy the novels! Please come by and let me know what you think when you’re done! Barnes & Noble has around 20% of e-book market share. As I estimated in my post on market share on August 2, Amazon probably has about 75% of the e-book market, and B&N has most of the rest: I pegged the figure around 18-20%. Today, B&N confirmed (without giving exact specifics, of course!) that their e-book market share is now “higher” than their print market share, which is 17%. Sounds like 18-20% to me! Explaining the slight dip in Q2 e-book sales. Lots of people receiving e-readers for Xmas 2009 and buying lots of e-books for their new toys in January 2010. Publishers insisted on agency model (read: higher) pricing starting in Q2, and raising new release e-book prices from $9.99 to $12.99 and $14.99 shockingly decreased revenue (who could have ever seen that coming?). The industry e-book sales figures don’t include sales from independent authors (like yours truly), who are probably earning a larger slice of the pie. Well, today I see a pair of articles analyzing the dip in Q2 e-book sales and attributing it to: post-Xmas buying and agency model pricing, and that indie author retailers like Smashwords weren’t being included in the data. I’ve spent a great deal of time discussing the emerging digital future of books on this blog, as it’s a topic I’m passionate about as both a reader and an author. But I’ve also spoken before about how bookstores don’t need to die alongside the decline of printed books, they can evolve and remain relevant, useful, and even profitable. And I also mentioned how Barnes & Noble seems to “get it,” and is doing a good job focusing on e-books and e-book readers (like their Nook), and is even offering a number of generous promotions for free e-books, coffee, and cookies — and they just lowered the price of the Nook to $199 and the Nook Wi-Fi to just $149. 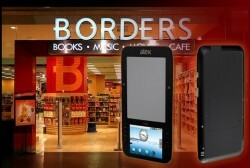 While I’ve heard that Borders is in financial trouble, I’d like to see a company with such a forward-thinking attitude pull through the tough times and stick around. Contrast the realistic, modern, and customer-friendly words and actions of B&N and Borders with the “Big 6” book publishers — who seek to “protect physical books as long as we can” by raising e-book prices, blocking lending and text-to-speech, delaying releases, and other anti-customer tactics. Although I’ve gone over almost exclusively to reading e-books, I still enjoy bookstores and would like for them to continue to exist as places devoted to readers. It’s through forward-thinking and innovative ideas like developing their own e-book readers and e-book stores, and offering free e-books and other incentives to get people into bookstores, that bookstores can remain relevant long into the digital age. 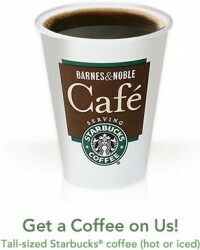 In addition to Barnes & Noble’s recent promotion offering a free $50 gift card with the purchase of a Nook e-book reader, they’re now offering a pair of new promotions: a different free e-book every week, and a free “tall” (which is Starbucks lingo for “small”) hot or iced coffee — just for showing them that you’re reading an e-book on your Nook or Barnes & Noble app for the PC, Mac, Blackberry, iPhone, iPod Touch, or iPad. For the past few weeks, B&N has been offering a different free e-book each week. 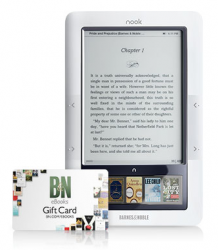 To qualify, just bring in your Nook or laptop / phone running the free B&N e-reader app. Show it to any B&N employee and they’ll give you a voucher to download a free e-book (which you can do right there in the store with their free Wi-Fi connection). This week’s book is Home Safe by Elizabeth Berg, and next week’s book (starting June 14) is The Long Tail by Chris Anderson. Free coffee too from B&N Cafe! While you’re there, head over to the B&N Cafe (that looks like a Starbucks, but is technically not) and show them that same Nook or device running the B&N app, and they’ll hook you up with a free tall coffee. The fine print says you get a non-customized hot or iced coffee, and can only redeem it once. They also point out that this only works at B&N Cafes, not at Starbucks, or at any Starbucks Cafe inside a B&N store. Confusing? Yeah, I didn’t even know most cafes inside B&N stores were “B&N Cafes,” I just thought they were all Starbucks. So you may want to call and check your local B&N before you head over. Anyway, that’s three pretty incredible deals from Barnes & Noble. A free $50 gift card is nothing to sneeze at, and the other two deals are even better since you don’t have to buy anything to qualify. You can just download the free B&N app to your laptop or phone, bring it in, and get a completely free e-book and free coffee. It’s a bold move by B&N to (a) get people into e-books and (b) drive foot traffic to their stores where they hope you browse and buy other stuff. It’s interesting that B&N is trying to increase business at its existing retail locations (that sell mostly paper books but increasingly sell gifts, cards, and accessories as well), but is also firmly committed to the future with the Nook and focus on e-books. I hope these moves pay off for them, because they seem well thought out, forward-thinking, and very customer-friendly. So, download the free B&N e-reader app for your favorite portable device, maybe pick up an inexpensive e-book or two (this one is just $2.99, and get another free e-book and some free coffee on your next visit to a Barnes & Noble store. Barnes & Noble announced today that they will be opening their doors to independent publishers and self-published authors through their “PubIt” program, expected to launch in “Summer 2010.” While this move isn’t exactly groundbreaking (my novels are already available at Barnes & Noble), it’s still a welcome step forward. Currently, self-published e-books are made available on B&N.com through an intermediary: Smashwords, which is a fine company that offers a great service to independent authors. Soon, however, we will have the ability to upload our work directly to B&N, which will presumably offer us more control, a faster turnaround (it can take months to get your books or any changes to show up on B&N), and possibly higher royalties. B&N says royalties will be announced within a few weeks, and promises they will be “competitive.” It is hard to imagine how they could offer less than the 70% that Apple offers and that Amazon will offer starting July 1. 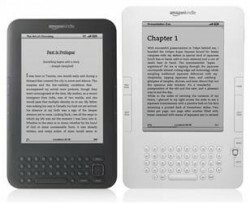 Amazon led the way for the self-publishing revolution with its Digital Text Platform, which allows any author to upload their work in e-book form to be sold on Amazon.com. So while one could argue that B&N has been following rather than innovating (releasing the Nook 2 years after the Kindle and arriving over a year late to the self-publishing scene), I’m glad to see B&N moving toward and embracing the future, unlike some businesses I could mention. I would expect a direct upload channel to B&N will enable me to create a higher-quality, better formatted source file (with Smashwords, it’s best to upload a simple, generically-formatted file that gets converted to multiple formats), quicker upload and revision times, better control over the description and category, and — hopefully — a higher royalty rate. Another big benefit might be quicker sales reporting: currently, Amazon Kindle sales are reported instantly … which leads to incessant checking several times a day. 😉 B&N sales, on the other hand, get reported through Smashwords, and are currently on a 3-5 month delay. I started selling on B&N at the very end of January, and I haven’t even received my first sales report yet — all I can do is watch my sales ranking and guess. So I don’t know if B&N is turning into a worthy second sales channel, or if B&N sales are still just a tiny fraction of Amazon’s. It would behoove B&N to get this info to me more quickly, so I would know whether or not it’s worthwhile to devote more promotional efforts their way. My only concern is whether the new file I upload will replace or sit alongside the Smashwords version that’s already active on B&N. I’d certainly like to keep my description, reviews, and sales ranking (Right Ascension has made it into the Top 7,500 there!). Anyway, it’s an exciting development, and having both the #1 and #2 booksellers in the world throwing their weight behind self-publishing is certainly an encouraging sign. I still have more questions than answers (How many am I selling on B&N? What will the royalties be? When will it launch? What format do they want me to upload? Can I migrate over my existing product details? ), but I remain hopeful. P.S. : I seem to get most of my feedback from Kindle users, so I’d love to hear from a few B&N / Nook users: Have you purchased my books from B&N? Have you enjoyed them? 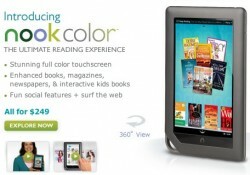 How did the formatting look on the Nook? How many of you are out there? ?